Biometrics is the term given to the use of biological traits or behavioral characteristics to identify an individual. The traits may be fingerprints, hand geometry, facial geometry, retina patterns, voice recognition, and handwriting recognition . In Biometric Voting System paper we have used thumb impression for the purpose of voter identification or authentication. As the thumb impression of every individual is unique, it helps in maximizing the accuracy. A database is created containing the thumb impressions of all the voters in the constituency. Illegal votes and repetition of votes is checked for in this system. Hence if this system is employed theelections would be fair and free from rigging. Thanks to this system that conducting elections would no longer be a tedious and expensive job. 4. Data transfer- using telephone lines .. The only pre-requisite for the use of this finger print scanner is a personal identification card. We hope that this system proves to be efficient and enables the people to be smarter in choosing their leaders. 1. FINGER PRINT SENSOR: This is used to scan the thumb impression. The data obtained from this is analog in nature. This is transferred to the A/D converter for further processing. 2. A/D CONVERTER: This is used to convert the analog data from the SENSOR into the digital data and transfer it to the processor. 3. FLASH ROM: This is for the storage of the data temporarily in the DSP processor. This will work until the data is transferred to the main memory of the HOST. 4. 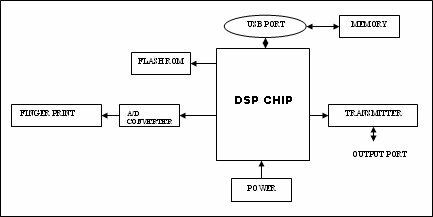 DSP CHIP: This is used to receive the data and process it. This is connected to the USB port for further transfer of the data. 5. 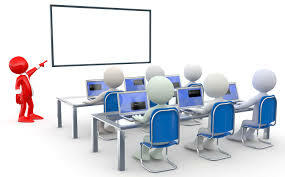 USB PORT : The sole purpose of the USB port is to establish a communication link between the DSP processor and the MEMORY (DATABASE).